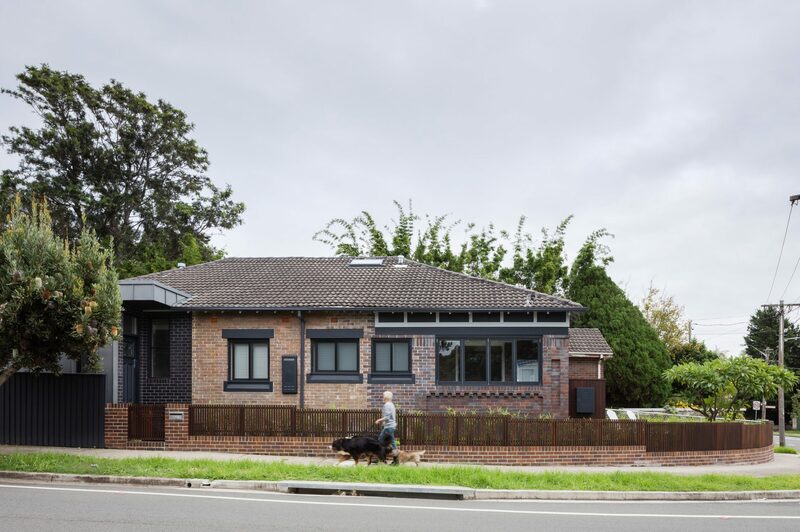 Our redesign of a 1930s semi on Sydney’s lower North Shore shifts attention away from a compromised corner frontage, instead bringing a new extended side entrance. On a site where there’s nowhere to hide, our small intervention stitches together old and new in a timeline told through the brickwork. A zinc-clad lateral extension reconfigures the interior flow of the semi with minimal alteration to internal walls, creating a more practical communal-to-private axis and substantially increased living area. The newly prominent side elevation is emphasised by a suite of varying brickwork that rather than attempting to conceal the realignment, underscores its, with the Bowral Blue dress bricks from the original front echoed in a contemporary, slimmer black brick, for the new ceremonial entry. Timber-battened panels are refurbished and mediate the zinc extension and patchwork of bricks. As the landscaping matures around the exposed corner frontage, it will bind together this interplay of old and new materials.